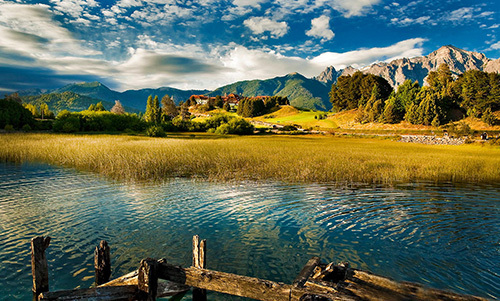 Bariloche is well known as a posh ski resort in the Argentinian Andes. But the town has a lot more to offer than just ski slopes. There is a great National Park nearby, and there are many hiking, biking, rafting and other outdoor activities waiting for you. Every season in Bariloche has its own special charm. Winter brings the excitement of skiing and the graduate trips that arrive between july and september. Fishing tackle in November, long, hot days in summer and crowded chocolate shops at Easter are typical of the changing seasons. Bariloche’s tourist area is located near the Centro Cívico, with the main shopping and business area centered on Mitre street, and to a lesser extent, Moreno and intersecting streets. There are chocolate factories, shops selling smoked food and knitted garments, restaurants and fast food outlets, tourist agencies, shows, and everything else that a first-class tourist resort can offer. Parapointing is available from the top of the ski resort during the summer months. Jumping off a mountain on a parachute is quite a thrill. Horseback riding and extensive trails are also available in the area.